This framework ISO9001 certification, widely applied in more than 75 organizations of 161 countries/regions in the world, by far is the world's most mature quality framework. 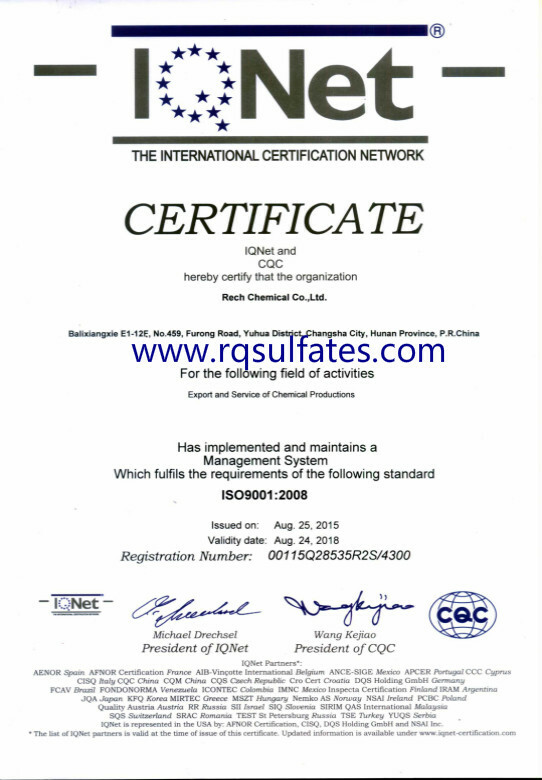 In zinc sulfate industry of Hunan, Rech Chemical Co. Ltd the first enterprise who obtained this certification. ISO9001 quality management system standard is one of the most influential standards issued by international organization for standardization (ISO). Since it&rsquo;s launched, the widely application of the world had greatly improved and influence the quality and the development of international trade. Only in China alone, there have been more than 310000 copies of ISO9001 certification that take up 30% of the global total, and China becomes the most ISO certificates country in the world. ISO9001 certification nowadays is widely applied in various fields of national economy in China and also plays a positive role in enterprise quality management and market competitiveness improvements. That the enterprises who passed ISO certification means this enterprises have reached the international standard in the management system integration and could steadily provide customer satisfied and qualified products. As a responsible zinc sulfate supplier, you can freely buy our products without worrying on quality and service from Rech Chemical Co. Ltd.